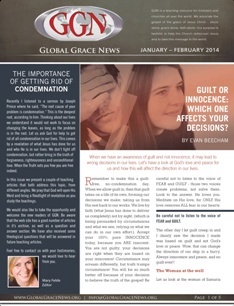 The January-February 2014 Global Grace News, newsletter has been posted. To view this edition, please click on the picture icon of the newsletter for the PDF version. Enjoy some great grace articles, including “Guilt Or Innocence: Which One Affects Your Decisions” by Evan Beecham, and “Forgiven” by Steve McVey. Check them out, You can also access Global Grace News by clicking here: Global Grace News You will be blessed! Grace and peace be multiplied to you! Sunday Feb 23, we had a special service to share about and pray for signs, wonders and miracles, and then we prayed for everyone at the service. We also have a special time of prayer at the end of the video and audio message for everyone who watches and listens to the services around the world via internet. Don’t ever think that God doesn’t have a miracle for you, He does! Please share your answered prayers and miracles with us, we would love to hear from you. God bless you! Posted on February 25, 2014 October 26, 2016 Author EvanCategories Grace Audio/Video MessagesLeave a comment on Signs Wonders and Miracles! 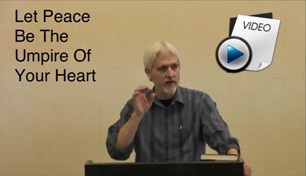 Let Peace Be The Umpire Of Your Heart! listen to the voice of FEAR and GUILT, those two voices create problems, not solve them. experienced in Christ. In Christ there is His love and His peace. In this message, learn to let peace be your umpire to make sound decisions in life. 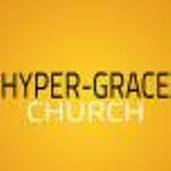 Posted on February 17, 2014 October 26, 2016 Author EvanCategories Abundance of Grace, Grace Audio/Video MessagesLeave a comment on Let Peace Be The Umpire Of Your Heart! Charisma Magazine recently published an article entitled “8 signs of hyper-grace churches.” Using words like “decline” and “distorted” and “sexually immoral” the article argued that churches built on the message of “free grace” are part of a “dangerous trend” that needs to be opposed and confronted. Continue reading…article by Paul Ellis. Fear, Guilt and Doubt Connection. Grace celebrates our pre-creation innocence and now declares our redeemed union with God in Christ Jesus! Guilt, shame and condemnation are false indicators that a person is not forgiven, Peter reminded folks continually of the truth that they are forgiven, in 2 Peter 1. Because we are forgiven, we are now clothed with His righteousness/innocence, and enjoy His peace. In this message, I’ll show you how fear is connected with, and alerts us to the presence of self-condemnation, guilt, and shame, and how if it goes unchecked can begin to cloud our decisions, creating FOG (Fear Obligation & Guilt) in our lives. When we allow this, we find ourselves laboring under the law, trying to fix things, and please God. Be continually reminded of your innocence in Christ, and live free. 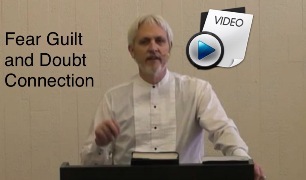 What do we allow to influence our daily decision, guilt or innocence? Be led by His peace because of His grace! Grace and peace to you! 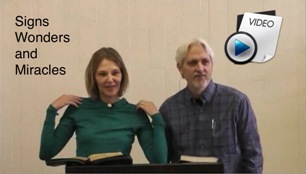 Posted on February 3, 2014 October 26, 2016 Author EvanCategories Grace Audio/Video MessagesLeave a comment on Fear, Guilt and Doubt Connection.